My story begins in Iraq, circa 2010-2011. When I arrived in Iraq to begin my mission in finance, the intention was to be a great NCO. A great believer. A great person. What happened was, I began to question my beliefs and de-convert. My commander was an over-zealous, religious bigot. He was also homophobic. You see, he attempted the BRAINWASH everyone in our unit. He almost succeeded. Gays are evil. Homosexuality is perverted. Being in a relationship with someone you love, means separating them to prevent "fornication" and violations of General Order #1. Married people do no have the right to converse with those who are not married. Saying a "hello" is adultery. Now, I don't condone going outside your marriage for comfort. If you want friends, include spouses. I have several married friends, and I know both their husband and/or their wife. I am also supportive of their bonds or matrimony. 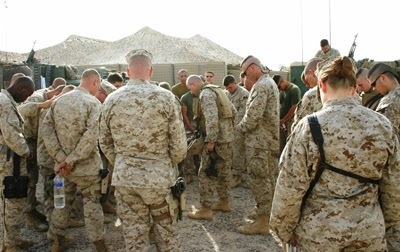 Becoming a deconverted Christian began when this commander told us people were "f****** up" because they wanted to spend time together and that their spending time together after duty was over was "detrimental to the mission". He lectured us about being moral and "godly" and how going into the opposite gender's room was a sin against "God". I began getting to know people outside my unit. Upon my encounters I met several members of the Pagan circle over there. While I didn't become a Pagan, and I didn't become an atheist, the circle did open my eyes to find open-minded people out there who weren't shoving their beliefs down other's throats. I am still searching for answers. I'm reading books about religion. I'm also analyzing the bible- looking at it from the perspective of a non-religious person. I'm not Christian. I'm not Wiccan. I'm not atheist. I guess you can say I'm Spiritual. I believe that there is room to question existence of the creator of the universe. I also don't believe that praying is going to make something happen. I don't believe that "god" made this person's cancer disappear. If "god" makes things disappear, why does cancer metastasize. Ask a christian that and they will tell you, part of God's plan. No, it isn't! People in my unit inquire as to why I don't judge them for their lives. Why I question thoughts. Why I let people live and don't give them "a** chewings" when they make a mistake that isn't repetitive. I'll tell you why... because I don't believe anymore. Because as free thinkers and human beings, we live. We breathe. We pass on. The best day that I woke up was the day I released myself from the burden of thinking about being a Christian. About being a believer. About the commander's ideas. I'm FREE! !